Presented are the chemical and phase composition,structure, thermophysical characteristics of promising inoculants based on the Al-Zr, Al-Cu-Zr, Al-Cu-Ni-Zr systems for Al and Cu alloys. Developed are process parameters of their production in amorphous and fine-crystalline state. Determined are conditions of formation of metastable cubic and stable tetragonal intermetallide Al3Zr,and its interaction with liquid Al- and Cubased alloys is evaluated. Results on the effect of modifying and refining additives for casting aluminum alloys and AK9M2 AMg11. Experimental established that the complex treatment of titanium alloy AK9M2 and boron, as well as refining flux increase the elongation of 60%, while the values of tensile strength of 22 MPa. AMg11 alloy modification titanium complex carbon and elongation increases from 1,0 to 5,0%, and a tensile strength of 180 to 250 MPa. Keywords:Aluminum, modification, refining, ligature, flux, crystallization. The analysis of Copper slag processing methods showed, that the mechanical methods are extracted only the part of metallic component and moreover are formed the harmful dust-like wastes, containing many heavy non-ferrous metals. And the hydrometallurgical method is multi-stages and expended, must to pay for itself only during the processing of major quantity of the same type slag. The pyrometallurgical method is the effective and flexible. However, in this case are not reached the full extraction the useful components and exist the high loss of highly volatile elements. The investigations of high-temperature intermetallic nickel alloys series VKNA/VIN after directional solidification. structural and phase parameters of the alloy, parameters of lattices g- and g?-phases, misfit identified. It is shown that long-rupture life of intermetallic alloys increases with increase of misfit. Enhanced are the service properties of electrical engineering strip profiles used at high electrical and mechanical loads in critical electric machines – rectangular copper buses (strength determination has been simplified, and surface finish evaluation accuracy has been improved), copper-cadmium trapezoidal collector strips (hardness has been increased, camber has been reduced, protrusions and marks on profile bases have been eliminated), and copper-silver collector strips (electrical resistance has been reduced, and stability of mechanical properties has been achieved). Key words:Electrical engineering copper, cadmium bronze, silver bronze, service properties, more accurate chemical composition. Afanasyev V.K., Herzen V.V., Dolgova S.V., Lavrova N.B., Popova M.V. About the features of the structure and the thermal expansion of aluminum alloy with high silicon content. In this paper we studied aluminum alloys with a high silicon content. Found that the crystallization of alloys Al–15…30%Si structure can be formed with fine discharge silicon phase (with varying degrees of the eutectic precipitates dispersion) and large (primary and secondary crystals). Developed methods of heat treatment, reinforcing the process of decomposition of large crystals to small. The correlation between the microstructure and thermal expansion alloys Al–15…30%Si. Responsible for the formation of the structure of the studied alloys is proposed that hydrogen. Key words:Hydrogen, aluminum-silicon alloy, microstructure, thermal expansion, thermal treatment. The experimental data of surface hardening coatings on fused-die tools when restoring a urea tank. The analysis of changes in the microstructure and mechanical properties of the weld various welding wire metal after cyanidation. Key words:Punching tool, cyanidation, urea bath. During the reconstruction, re-equipment, modernization and creation of a new thermalequipment, it is necessary to choose units and technologies that provide greater efficiency and higher efficiency equipment, strict compliance with environmental and safety standards. Stably ensured is a high level of quality and quantity characteristics of critical products for machine building from Cu-Be alloys– pressed and cold-drawn bars of round, square and hexahedral cross section, and wire. The products fully meet the demands of Russian and foreign standards for semi-finished products. 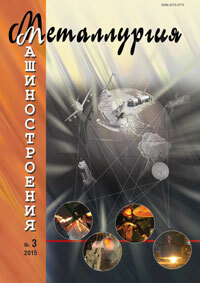 Specific character of manufacturing of copper-phosphorous brazing rods 4...10 mm diameter in Russia was presented. The possibility of using upward continuous casting for manufacturing copper–phosphorus solders 4, 6 and 10 mm diameter is shown. The advantages of upward continuous casting of small gauge of billets in comparison with downward and horizontal continuous casting were indicated. The specific futures of billet solidification during upward continuous casting were presented. The technology of producing copper-phosphorous brazing rods 4...10 mm diameter based on upward continuous casting is inculcated in industry. The further areas of research have been provided. Key words:Copper-phosphorous solders, upward continuous casting, small gauge of billets, die mold, solidification front.